The name anaconda comes from the language of Sri Lanka, and refers to another snake entirely. The python and the anaconda were apparently at one time mistaken for each other. Early settlers to the country called this snake bull killer. The anaconda is considered to be the largest snake in the world today. They can easily reach lengths of over 25 feet. Roughly that is longer than most people’s living room, or far longer than your car. The females are generally larger than the males. The anaconda may vary in color, from deep green, with black oval patching on its back to brownish color. Different types will have different colorations. The Anaconda is the heaviest snake, but it may or may not be the longest. The Reticulated python rivals the Anaconda for the longest snake. A 20-foot Anaconda will weigh more than a 33-foot python. The Anaconda can weigh 550 pounds or more, but will usually top out at a few hundred pounds. 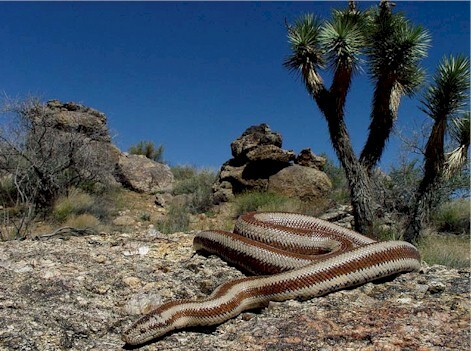 These snakes can measure more than 12 inches in diameter. The female typically outweighs the males. The Green Anaconda is dark green in color with black oval patches on its back. This drab pattern blends the snake in well with the wet, dense vegetations of its habitat. The sides have similar spots with yellow centers. The Yellow Anaconda is true to its name and is mostly yellow with similar black spots. The scales of the yellow and black underside of the lower tail on these Anacondas have a particular pattern which is unique to each snake. It’s a form of identification, like a human fingerprint. Anacondas like to spend most of their time in the water. When they are out of the water for any lengthy period of time they become prey for a multitude of ticks. Anacondas are built with a very large head and a thick neck. They have eyes on the top of their head, helping them to breathe and to also see their prey when they are lying beneath the water. The anaconda is a constrictor, and is not poisonous, but still has incredibly strong teeth with which it holds its prey still as it pulls it beneath the water to drown it. They usually eat larger rodents, such as tapirs and capybara. They have been known to kill a jaguar and attacks on humans, although very rare, do happen. Anacondas are usually coiled up in a murky, shallow pool or at the river’s edge. They wait to ambush their unsuspecting prey when they come down for a drink. Anacondas bite their prey with their sharp teeth, hold on with their powerful jaws and pull them under water. The victim may drown first or it may be squeezed to death in the Anaconda’s muscular coils. The Anaconda has a very slow-acting digestive system. After a meal many anacondas will not eat for several weeks, perhaps a month. One anaconda did not eat for over a year. Anacondas give birth to live young. After mating she will hold her young for about 6 months, and then have a litter of from 25-40 babies. They are about 2 feet long when born; they are also, because of their small size prey for other animals. Within hours after their birth they can swim, hunt and take care of themselves. Anacondas can live to be over 35 years old. I JUST WANTT YOU TO TELL YOU THAT IM GLADD OF NATURE! i’m also a lover of nature. I am indeed fascinated with the jaw-breaking, mouth-opening, snakes you have shown on your site i use to think that such snakes were simple exaggeration on movies and films. I never new such snakes as large as anacodas existed until i checked your website. if possible please send me new pictures of newly cuptured gigantic snakes. all nature is amazing..including human..
this is very dangrous. it is a long anaconda. is very lash the anaconda. its really a wonderful information about nature.one should have a relaxed mind to learn how nathure gives enlightment to humans, but we humans instead of saving them we destroy them.thats really a pity. NATURE IS GOD’S MOST BEAUTIFUL CREATION. Nature is wonderful! May God be praised! Nature is wonderful! May God be praised! Anacondas are fascinating animals. can you tel me where to get one. i am a true lover of nature. I like Nature, This is God’s gift to me and all people. Water is like one of the most physical factor. your thinking is good. I always surf such sites and in love with nature. If you have any special collection please mail me. i love anacondas, they are realy pretty and i grew up watching the movies. i love them,this is one interesting creature that id love to learn more about. AND THE HEIGHT 20 TO 90 FEET. i loved the pictures of the anaconda. this earth is so wonderful and its full of amazing god’s creatures! I love nature, love and protect. I love Anacondas! Iam just so amazed in themand how big they are. do you want to see anaconda really. i love anaconda and want to see it. hello kajal, i m very fond of snakes & i want to see anaconas. And I hate closed-minded nature haters like you. than k u but that,s a little harsh. u now wat people like wat they like so shut up ok? AND u should learn to like others .The world is wicked these days sorry if i sound harsh. man!!!!! if nature wasnt here what where else ar creatures and animals goin to liiiiiiiiiiiiiiiivvvvvvvvvveeeeeee. omg i love animalas and u guys luj awesome i wonder if he was heavy lol.. I love nature. They make the ecosystem complete. This is incredible.I would love to see the giant Anaconda live. im afraid of anaconda’s but i’d luv to have one as a pet………..